Christopher R. Sall | Fafinski Mark & Johnson, P.A. 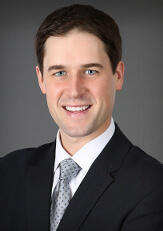 Chris Sall is an associate with FMJ where he focuses his practice on commercial litigation, representing both plaintiffs and defendants in a variety of industries and practices areas, including real estate, employment, aviation and other business litigation matters. Prior to joining FMJ, Chris primarily devoted his practice to defending employers and insurers in workers’ compensation litigation throughout Minnesota. Over the course of defending hundreds of claims, Chris gained invaluable experience working directly with clients with their reputation and financial well-being on the line. Ancillary to his litigation practice, Chris has a passion for working with both established and aspiring professional athletes. In fact, working for a multi-national sports marketing firm after college is what persuaded Chris to pursue his JD. As a native of Duluth, Minnesota, Chris loves all things hockey. He is an avid Minnesota Wild fan and is anxiously anticipating the day when the Stanley Cup finds a home in St. Paul. In the summer, you can expect to find Chris on the golf course or traveling to northern Minnesota to visit family and friends.